Bengaluru is a city which has cool places to see around. Big banyan tree and manchinbele dam is one of the best examples. If you don't have much time to go for a trip, and planning for a picnic around bangalore, this would be the ideal place to visit. 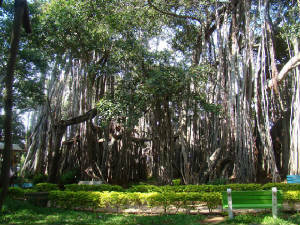 Big Banyan tree is a 400 year old tree which has spread over 3 acres of land. It is around 25 km from the bangalore city. Don't expect much out of it. It is just like a park in the city having few benches to sit and pass the time but with no disturbance of traffic and dust. 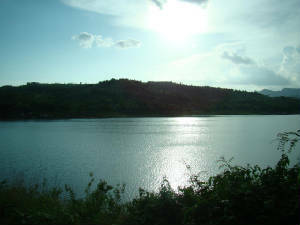 Manchinbele Dam is a Dam constructed by Sir.M.vishweshwaraiyah which is around 8 km s from Big Banyan tree. If you go by bike or any private vehicle, you can cover both these places in half a day. This is a scenic place unlike the BB tree where you can take some snacks and enjoy with the family or friends. One 'view point' is there in the backwater side which is a 'restricted area'!!! For visiting there, we were forced to pay for an unkown person who called himself as watchmen of that place!.